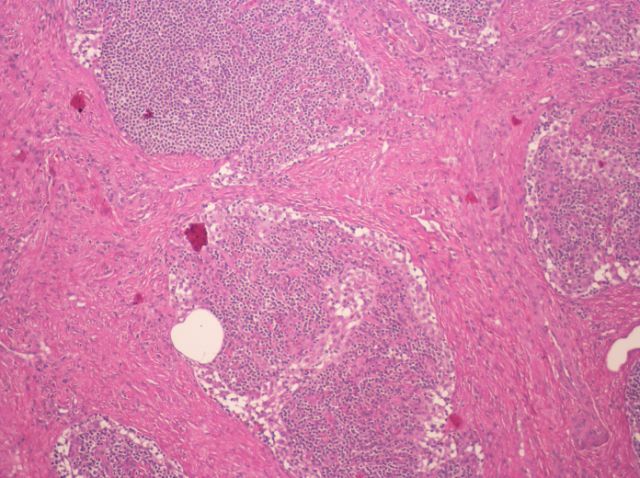 (1) View our new mystery image of the month on the Home Page, on the right hand side.� Click on the image to expand it, or on the link for the diagnosis. �(2) Some images don�t appear the first time you click on a link, particularly those with URLs beginning �www3.interscience.wiley.com�.� You need to hit the refresh button (arrows going up and down) to view the image.� Although this is troublesome, the pictures are very good, so we believe it is worth the effort.� (3) Don�t forget to use Control F to find any text within a page.� This may be faster than using the Table of Contents for some chapters. We thank Dr. Vincent Graffeo, Peninsula Medical Center, Salisbury, Maryland (USA) for contributing this case and much of the discussion. 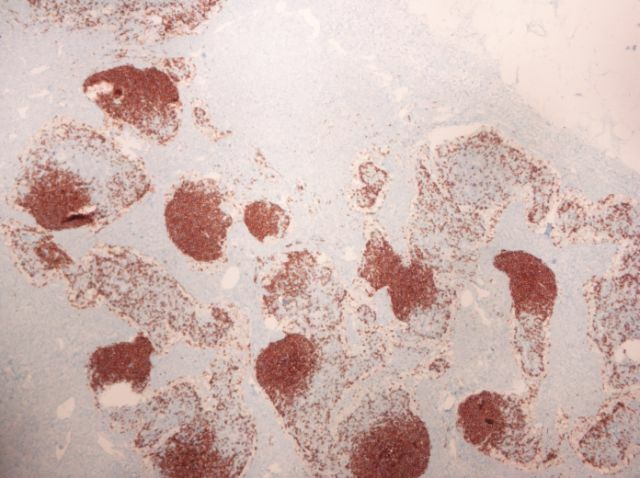 �To contribute a Case of the Week, email NatPernick@Hotmail.com with the clinical history, your diagnosis and microscopic images in JPG, GIF or TIFF format (send as attachments, we will shrink if necessary).� Please include any other images (gross, immunostains, etc.) that may be helpful or interesting.� We will write the discussion (unless you want to), list you as the contributor, and send you $35 (US dollars) for your time after we send out the case.� Please only send cases with high quality images and a diagnosis that is somewhat unusual (or a case with unusual features). A 60 year old man had a several year history of moderate to severe right lower leg edema, relieved at rest in the evening while lying down. �Physical exam revealed right inguinal lymphadenopathy. �An excisional lymph node biopsy was performed. 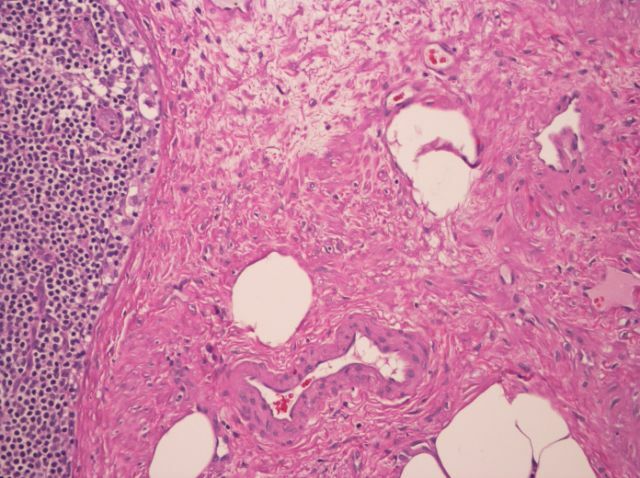 Sections show a lymph node with an effaced architecture. �The nodal tissue is partially replaced by a proliferation of smooth muscle, dilated and ectatic vessels and sclerotic stroma, with residual nodules of lymphoid tissue. �The lymphocytes are small and mature, with larger transformed cells and a few germinal centers. �There are patent sinuses with moderate sinus histiocytosis. �The thick walled vessels are more prominent in the hilum and there is a small amount of mature adipose present. 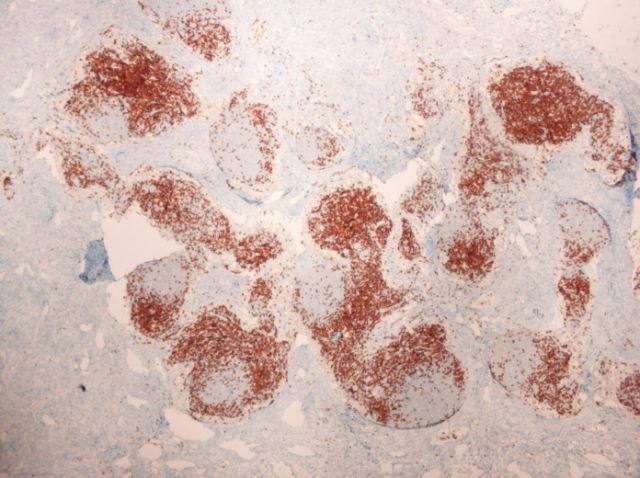 �CD3 and CD20 immunostains demonstrate an unremarkable mixture of T and B lymphocytes in the nodules. �Flow cytometry was negative for a monotypic B cell population. 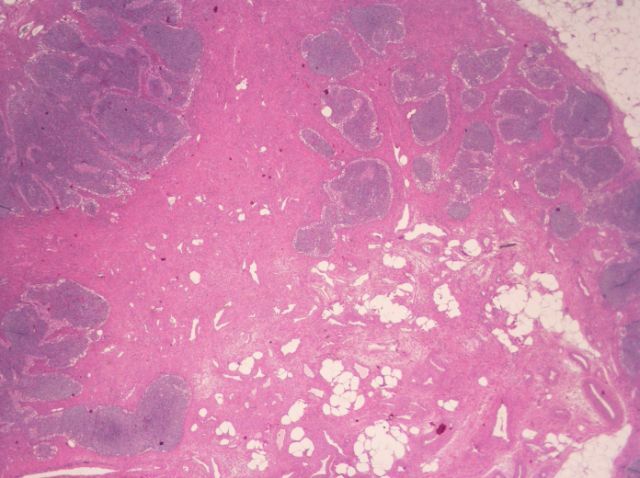 Angiomyomatous hamartoma, first described in 1992 (AJSP 1992;16:335), is a rare, benign smooth muscle proliferation with a predisposition for inguinal lymph nodes. �Patients of varying ages are affected, with a male predominance. �The lymph nodes are enlarged and may be matted. �Ipsilateral limb edema often accompanies this process, which may be long standing.� Excision is curative. 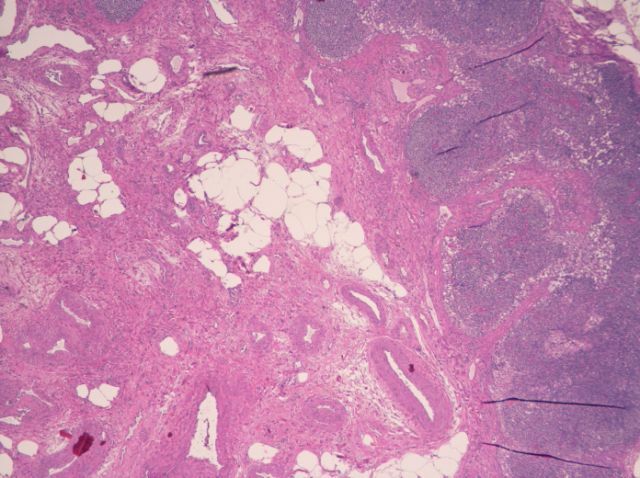 Other case reports: 51 year old with 4 cm mass (Pathol Int 2000;50:655), lymph node with significant adipose tissue involvement (Gen Diagn Pathol 1997;143:247).